The Director of Sales is the Sales head who takes full charge of the Company’s Sales Department, the job role for the Director of Sales is to work closely with the top management and assist them in determining an appropriate sales strategy, optimize business opportunities, create lucrative sales target or networks, observe market, identify the related trends, monitor the competitors, control expenses and draft possible cost cuts and understand category-specific landscapes. These directors should also oversee accounting management and aim at maximizing sales activities. 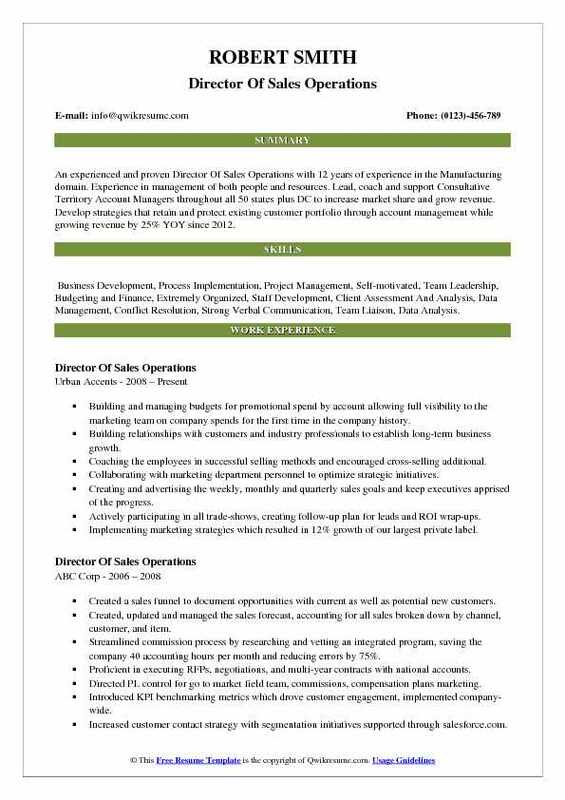 Some best job skills that will highlight the director of sales resume include experience in direct and outside sales (Preferably B2B), sound prospecting skills, and exceptional verbal and communicative skills with strategic thinking capacity. 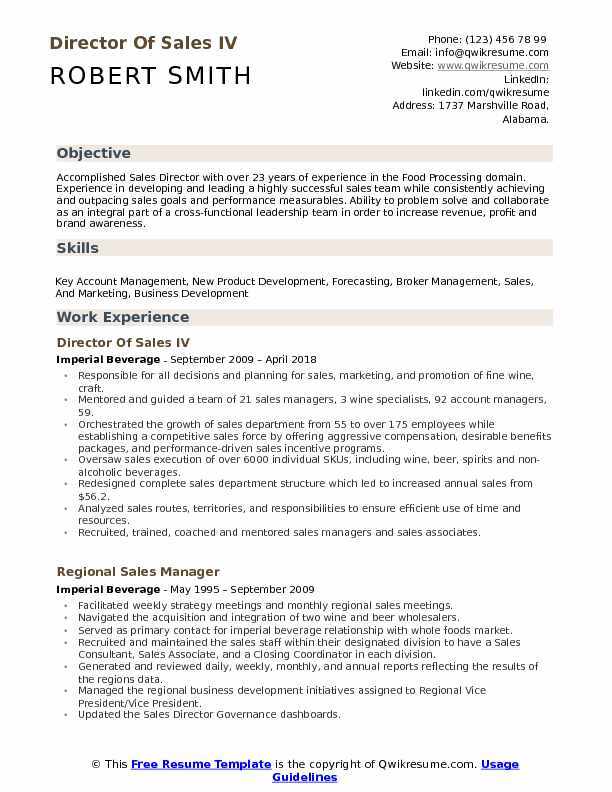 A good Director of sales Resume makes a display of a Master’s degree in sales, marketing or Business administration. Summary : Accomplished Sales Director with over 23 years of experience in the Food Processing domain. Experience in developing and leading a highly successful sales team while consistently achieving and outpacing sales goals and performance measurables. Ability to problem solve and collaborate as an integral part of a cross-functional leadership team in order to increase revenue, profit and brand awareness. Responsible for all decisions and planning for sales, marketing, and promotion of fine wine, craft. Mentored and guided a team of 21 sales managers, 3 wine specialists, 92 account managers, 59. Orchestrated the growth of sales department from 55 to over 175 employees while establishing a competitive sales force by offering aggressive compensation, desirable benefits packages, and performance-driven sales incentive programs. Oversaw sales execution of over 6000 individual SKUs, including wine, beer, spirits and non-alcoholic beverages. Redesigned complete sales department structure which led to increased annual sales from $56.2. Analyzed sales routes, territories, and responsibilities to ensure efficient use of time and resources. Recruited, trained, coached and mentored sales managers and sales associates. Improved sales policies and practices, defined the sales cycle, created accurate job descriptions and developed standards for customer relationship management. Created imperial beverage "go to market" strategy, created and developed the internal culture of the sales team. Planned and executed weekly performance meetings and monthly sales meetings. 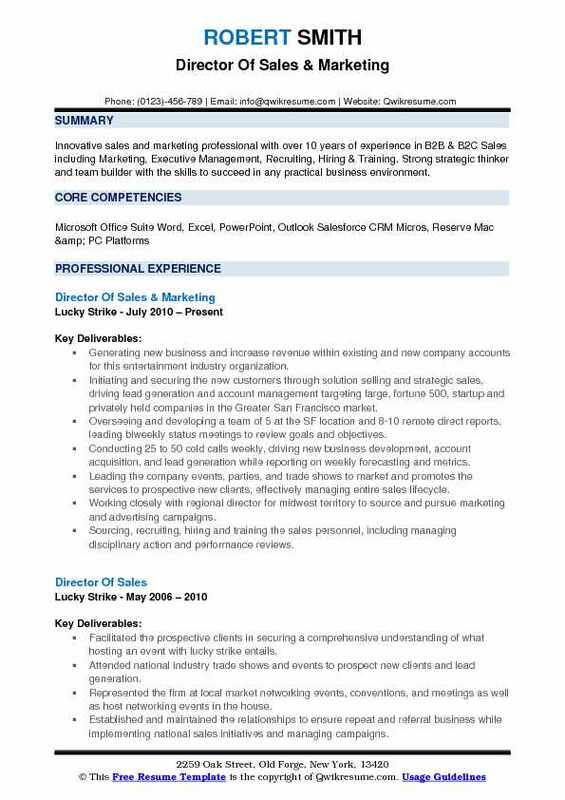 Summary : Innovative sales and marketing professional with over 10 years of experience in B2B & B2C Sales including Marketing, Executive Management, Recruiting, Hiring & Training. Strong strategic thinker and team builder with the skills to succeed in any practical business environment. Generating new business and increase revenue within existing and new company accounts for this entertainment industry organization. Initiating and securing the new customers through solution selling and strategic sales, driving lead generation and account management targeting large, fortune 500, startup and privately held companies in the Greater San Francisco market. Overseeing and developing a team of 5 at the SF location and 8-10 remote direct reports, leading biweekly status meetings to review goals and objectives. Conducting 25 to 50 cold calls weekly, driving new business development, account acquisition, and lead generation while reporting on weekly forecasting and metrics. Leading the company events, parties, and trade shows to market and promotes the services to prospective new clients, effectively managing entire sales lifecycle. Working closely with regional director for midwest territory to source and pursue marketing and advertising campaigns. Sourcing, recruiting, hiring and training the sales personnel, including managing disciplinary action and performance reviews. 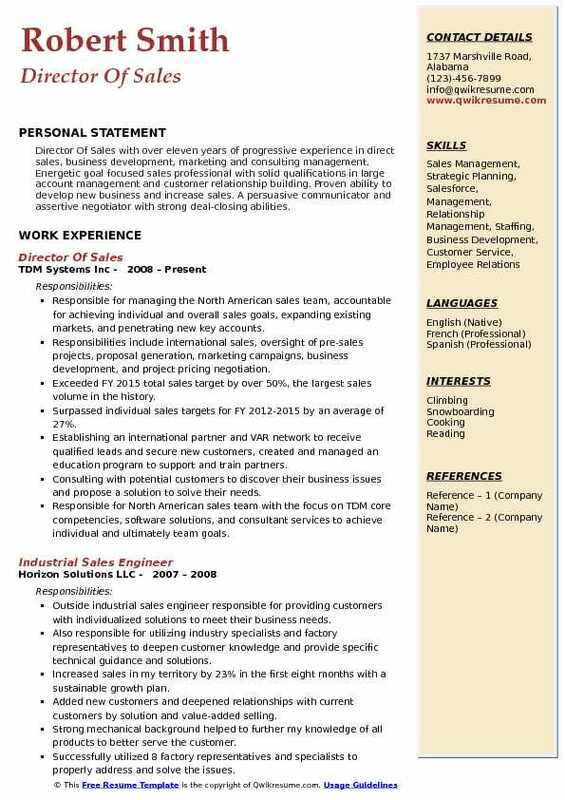 Summary : An experienced and proven Director Of Sales Operations with 12 years of experience in the Manufacturing domain. Experience in management of both people and resources. Lead, coach and support Consultative Territory Account Managers throughout all 50 states plus DC to increase market share and grow revenue. Develop strategies that retain and protect existing customer portfolio through account management while growing revenue by 25% YOY since 2012. Skills : Business Development, Process Implementation, Project Management, Self-motivated, Team Leadership, Budgeting and Finance, Extremely Organized, Staff Development, Client Assessment And Analysis, Data Management, Conflict Resolution, Strong Verbal Communication, Team Liaison, Data Analysis. Building and managing budgets for promotional spend by account allowing full visibility to the marketing team on company spends for the first time in the company history. Building relationships with customers and industry professionals to establish long-term business growth. Coaching the employees in successful selling methods and encouraged cross-selling additional. Collaborating with marketing department personnel to optimize strategic initiatives. Creating and advertising the weekly, monthly and quarterly sales goals and keep executives apprised of the progress. Actively participating in all trade-shows, creating follow-up plan for leads and ROI wrap-ups. Implementing marketing strategies which resulted in 12% growth of our largest private label. Initiated two key partnerships with Amazon and Big Lots, which resulted in 18% revenue growth in 2017. Managed seasonal private label product development from the concept-ing stage to the on-shelf presentation and sales for three key private label customers, resulting in category growth of 300% over three years. Overseeing all aspects of the sales cycle, strategic planning, and forecasting of sales, developing structure and managing the PL and expenses. Developing, training, coaching and mentoring high functioning sales and support team. Developing and implementing the strategic sales plans and forecasts to achieve corporate objectives for products and services. (achieved planned growth of 12%). Planning and overseeing advertising and promotion activities including print, online, electronic media, and direct mail. Developing and recommending the product positioning, packaging, and pricing strategy to produce the highest possible long-term market share. Achieving the satisfactory profit/loss ratio and market share in relation to preset standards and industry and economic trends. Developed sales call matrix utilized by the sales team to assist in growing existing client business. 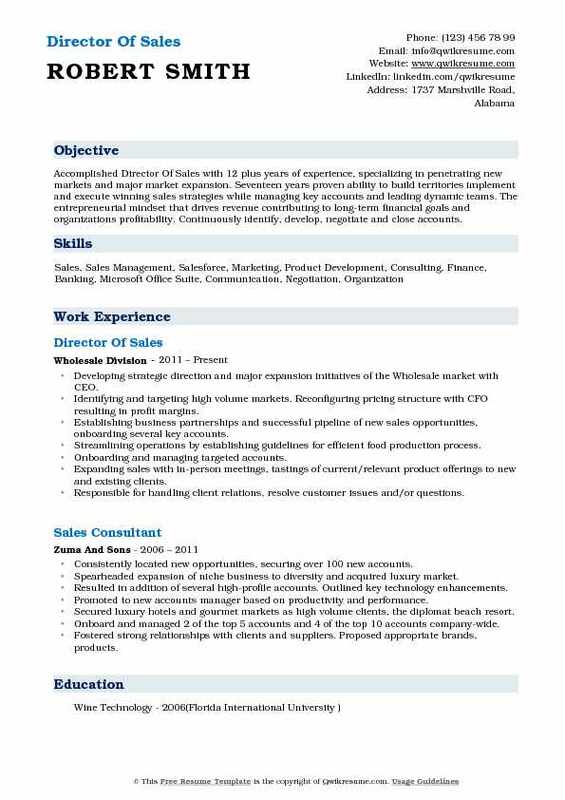 Summary : Director Of Sales And Marketing with 18 years of experience in the Engineering domain. Quick and effective decision making while planning production and demonstrating a high level of ownership and initiative. Responsible for sales and visual setup at trade shows and festivals in LA, NY now, and Las Vegas. Sourced/purchased raw materials, requested quotes, negotiated costs, tracked and follow up on lead times, containers and packages. Directly assisted the President of the Company for correspondence, booked flights/rooms for accommodations, relayed bi-weekly goals and share product knowledge with staff. Managed raw material, finished good inventory and ordered cycle counts. Developed, nurtured and maintained relationships with new and existing buyers and vendors as well as new product categories. Made offerings to major retailers and managed their individual projects from beginning to end. Recommended high end and closeout styles and fragrances based on demographic area and inventory levels. Created and followed up on domestic and international pos for trims, tickets, raw materials and production work orders. Used existing networking opportunities to create successful ongoing relationships with vendors. Oversaw all facets including sales, order entry, internal production follow-up, shipping updates, along with business functions and wholesale buyer meetings. 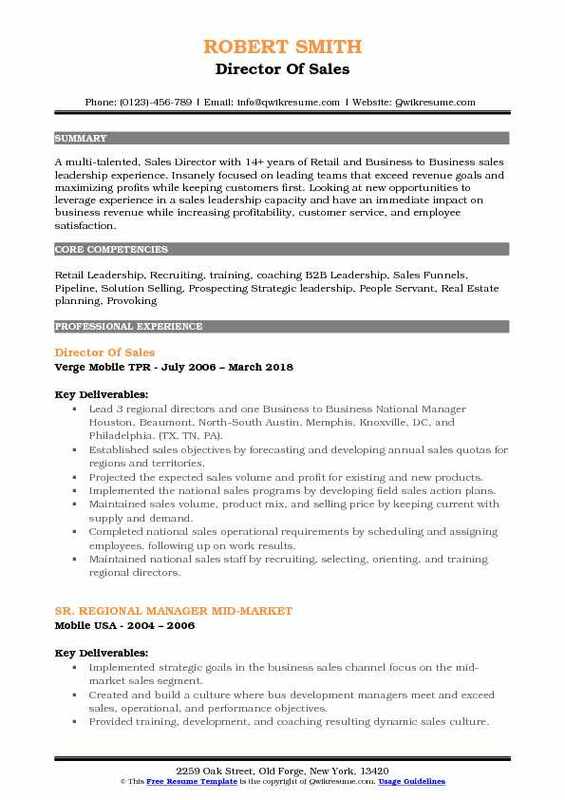 Summary : Accomplished Director Of Sales with 12 plus years of experience, specializing in penetrating new markets and major market expansion. Seventeen years proven ability to build territories implement and execute winning sales strategies while managing key accounts and leading dynamic teams. The entrepreneurial mindset that drives revenue contributing to long-term financial goals and organizations profitability. Continuously identify, develop, negotiate and close accounts. Developing strategic direction and major expansion initiatives of the Wholesale market with CEO. Identifying and targeting high volume markets. Reconfiguring pricing structure with CFO resulting in profit margins. Establishing business partnerships and successful pipeline of new sales opportunities, onboarding several key accounts. Streamlining operations by establishing guidelines for efficient food production process. Onboarding and managing targeted accounts. Expanding sales with in-person meetings, tastings of current/relevant product offerings to new and existing clients. Responsible for handling client relations, resolve customer issues and/or questions. Working closely with marketing director to develop wholesale deck, additional marketing and presentation. Managing production team implementing solutions for better interdepartmental communication from order. Processing and handling, to logistics and delivery. Standardizing policies and procedures, improving productivity, time management and reduce the need for overtime on high production days. 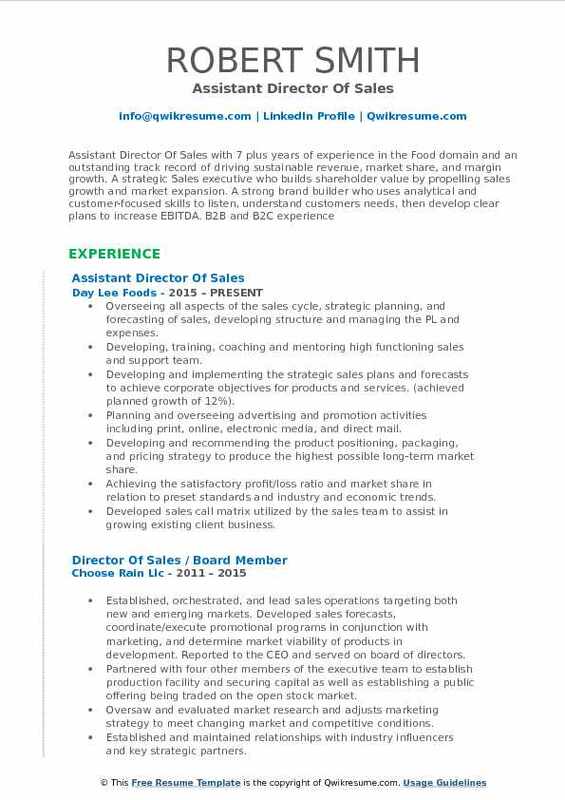 Summary : Results-oriented Director Of Sales with 21 years of experience in developing effective sales strategies in several different verticals, seeks to join a sales team to exceed growth, revenue, and sales targets. Reporting directly to the GM and Owner, directing sales for the engineering firm that focuses on fall protection training and equipment. Responsible for the guidance, operations and profitability of the sales team, web sales, customer service and critical marketing initiatives. Applying metrics of phone calls, emails, and quotes written to establish a pipeline percentage goal that translated into a 15% increase in first-year sales and 10% in year two, while replacing underperforming sales personnel. Adding structure and guidance to sales team via “one on one” weekly mentoring sessions with sales associates, reviewing all metrics, sales tactics, habits and process to increase sales and performance. Developing national territories and annual sales goals, including revised commission, bonus, and pricing programs. Realigning hiring and recruiting practices to create a more professional team, replacing 50% of them within first 10 months. Leading the team through the implementation of SAP/B1 and integration with the act to manage 50k+ contacts. Managing vendor relationships with over 3 dozen suppliers, including pricing, contracts, marketing and bonus programs. Introduced the company to over 100 large firms (f500 $100mm+) in multiple industries, while exceeding my monthly sales goals. 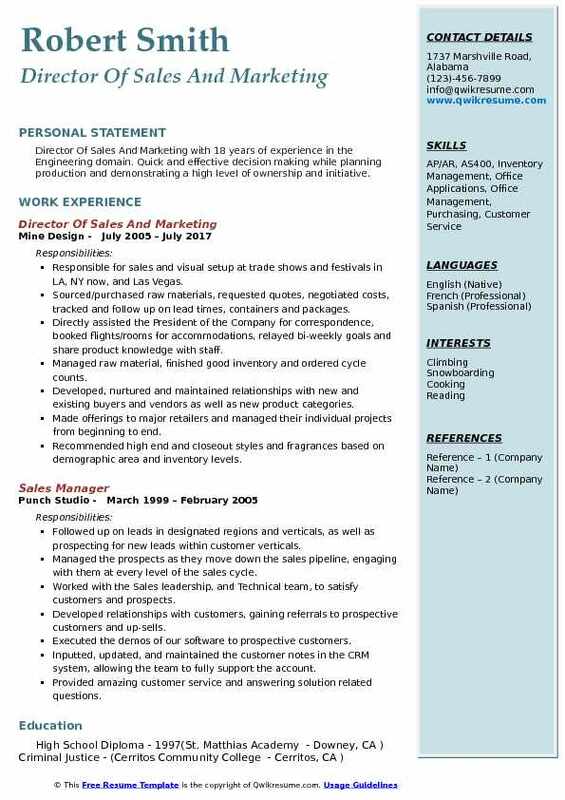 Summary : A multi-talented, Sales Director with 14+ years of Retail and Business to Business sales leadership experience. Insanely focused on leading teams that exceed revenue goals and maximizing profits while keeping customers first. Looking at new opportunities to leverage experience in a sales leadership capacity and have an immediate impact on business revenue while increasing profitability, customer service, and employee satisfaction. Lead 3 regional directors and one Business to Business National Manager Houston, Beaumont, North-South Austin, Memphis, Knoxville, DC, and Philadelphia. (TX, TN, PA). Established sales objectives by forecasting and developing annual sales quotas for regions and territories. Projected the expected sales volume and profit for existing and new products. Implemented the national sales programs by developing field sales action plans. Maintained sales volume, product mix, and selling price by keeping current with supply and demand. Completed national sales operational requirements by scheduling and assigning employees. following up on work results. Maintained national sales staff by recruiting, selecting, orienting, and training regional directors. Maintained national sales staff job results by counseling and employees accountable. 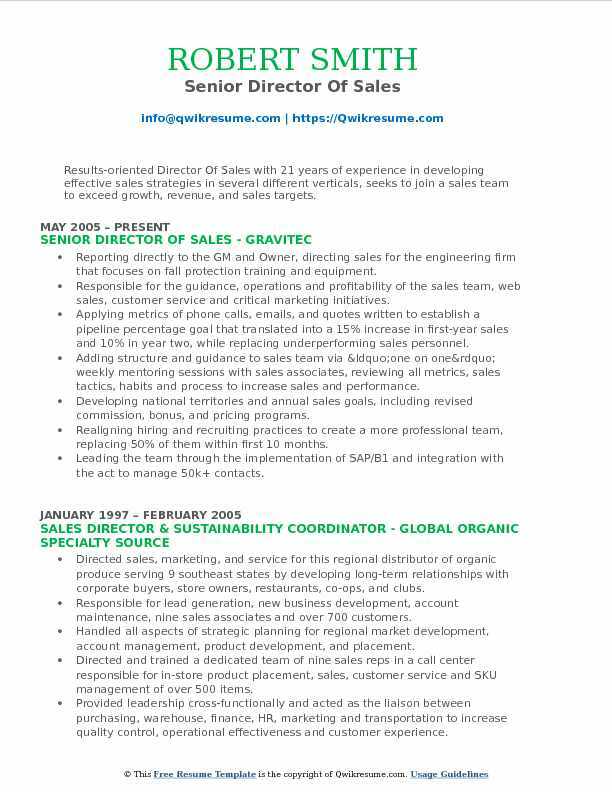 Summary : Director Of Sales with over eleven years of progressive experience in direct sales, business development, marketing and consulting management. Energetic goal focused sales professional with solid qualifications in large account management and customer relationship building. Proven ability to develop new business and increase sales. A persuasive communicator and assertive negotiator with strong deal-closing abilities. Responsible for managing the North American sales team, accountable for achieving individual and overall sales goals, expanding existing markets, and penetrating new key accounts. Responsibilities include international sales, oversight of pre-sales projects, proposal generation, marketing campaigns, business development, and project pricing negotiation. Exceeded FY 2015 total sales target by over 50%, the largest sales volume in the history. Surpassed individual sales targets for FY 2012-2015 by an average of 27%. Establishing an international partner and VAR network to receive qualified leads and secure new customers, created and managed an education program to support and train partners. Consulting with potential customers to discover their business issues and propose a solution to solve their needs. Responsible for North American sales team with the focus on TDM core competencies, software solutions, and consultant services to achieve individual and ultimately team goals. Piloting the development and creation of packaged solutions to address changing market. 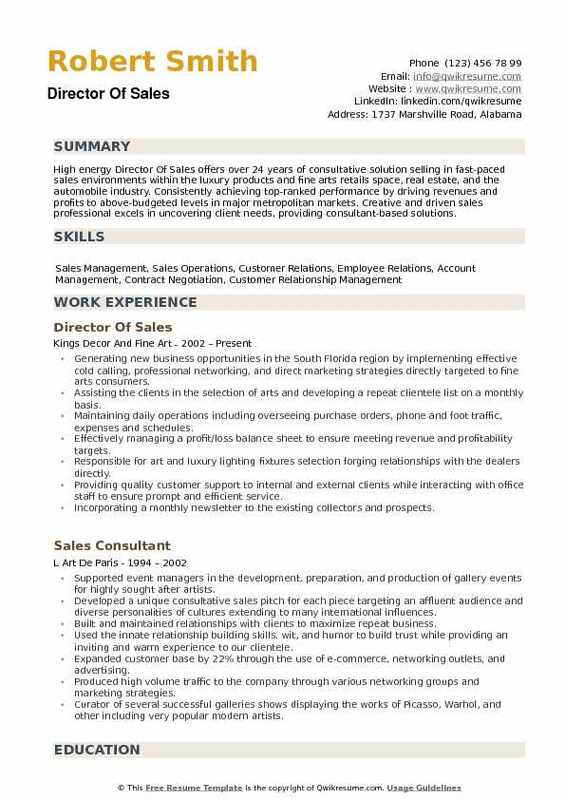 Summary : High energy Director Of Sales offers over 24 years of consultative solution selling in fast-paced sales environments within the luxury products and fine arts retails space, real estate, and the automobile industry. Consistently achieving top-ranked performance by driving revenues and profits to above-budgeted levels in major metropolitan markets. Creative and driven sales professional excels in uncovering client needs, providing consultant-based solutions. Generating new business opportunities in the South Florida region by implementing effective cold calling, professional networking, and direct marketing strategies directly targeted to fine arts consumers. Assisting the clients in the selection of arts and developing a repeat clientele list on a monthly basis. Maintaining daily operations including overseeing purchase orders, phone and foot traffic, expenses and schedules. Effectively managing a profit/loss balance sheet to ensure meeting revenue and profitability targets. Responsible for art and luxury lighting fixtures selection forging relationships with the dealers directly. Providing quality customer support to internal and external clients while interacting with office staff to ensure prompt and efficient service. Incorporating a monthly newsletter to the existing collectors and prospects. Aligning corporate sponsors for exhibits and originated outside sales and in-gallery events. Subsidizing off-season sales by implementing gallery rental for private events and art rentals for special events outside of the gallery. Introducing new qualified clients to the gallery within the Palm Beach, Broward County, and Miami territory organically.